String buzz on a bass can happen for many reasons. In some cases, the instrument isn't the issue at all. Improper playing technique, such as placing your finger directly between frets as opposed to right behind the fret, can cause string or fret buzzing. 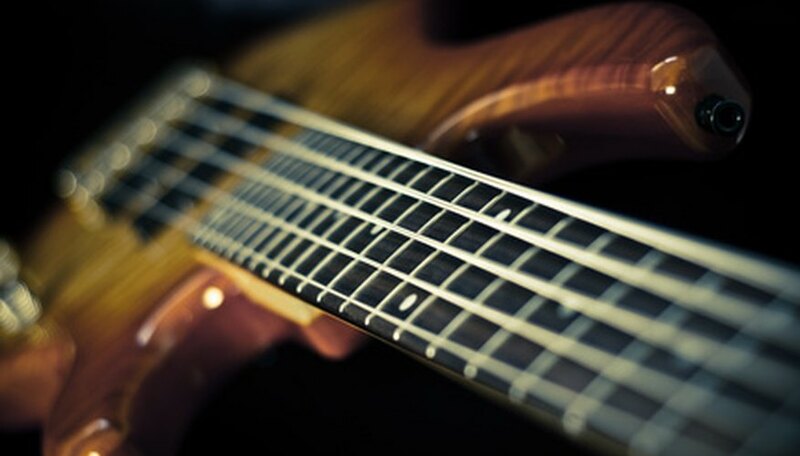 Excessive buzzing on your bass can be annoying and affect the quality of your playing. With a little investigating and a few adjustments, you can give your bass a new sound that will keep the buzz at bay. Check your playing technique before you make adjustments to your bass. Look at where you place your fingers when you play. Pressing down in the center between two frets can cause strings to buzz. Ensure you place your fingers directly behind the fret you're playing. If this doesn't eliminate your buzzing problem, it may be in the bass itself. Hold your bass up and look beneath the strings. If any of them are touching the frets, raise the strings that touch the frets. Adjust string height by raising the height at the bridge with a hex wrench or standard screwdrivers, depending upon the brand model of your bass. Tighten or loosen the height screws on the saddle as needed. To rise the action (the distance of the string from the neck of the guitar), turn the height adjustment screw clockwise. If string height is the cause of your fret buzz, this may be the issue. Raise the string causing the problem. If you aren't sure which string is the problem, begin with your lowest string and raise it until you can play it up the neck comfortably and without excessive buzz. Adjust the height of the other strings accordingly. In rare cases, the nut on your bass may not have been cut properly at the factory. While you can attempt to file the nut wider or deeper using a file, it might be helpful to replace the old nut. On a bass guitar, some fret or string buzz is normal. Unamplified bass strings will buzz to some degree. Bring your strings up just enough to eliminate buzz. If you bring them up too high, fretting notes will be a workout.